Are you being contacted about a deceased person's debt? 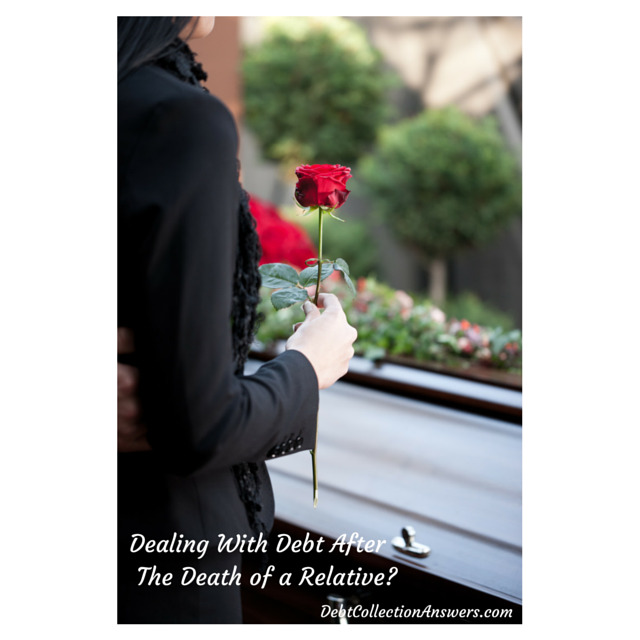 The last thing you need when you are mourning the death of a loved one are calls from debt collectors demanding that you pay his (or her) past due debts. Yet, collecting the debts of the dead is a growing and lucrative market for debt collectors. According to a New York Times article, one debt collection firm even transfers grieving relatives to a grief counselor who tries to help them cope with their emotions so that the collection firm will be more successful collecting from the bereaved relatives at a later date! Creepy, huh? And pretty outrageous too, especially considering that in many instances surviving relatives are under no legal obligation to pay the unpaid debts of their deceased loved ones. Sadly however, many relatives do pay deceased persons debts out of a sense of obligation to the person they have lost - even when it puts them in a financial bind. Are You Responsible For Their Debts? What's in an estate? An estate is all of the assets owned by the deceased and it’s the responsibility of the deceased’s creditors to file claims for payment from the estate with the probate court in the state where the deceased resided. Certain assets may pass to beneficiaries or spouses outside the estate and so they are not subject to claims against estate of the person who died. For example, if your relative had a life insurance policy and named you as the beneficiary, that money is yours, and cannot be taken by the deceased person's creditors. Retirement accounts left to a beneficiary are usually protected as well. Joint property you owned with the person who died may also be safe. What is probate? Probate is a legal process for administering the estate of someone who died. During probate, anyone who is owed money can file claims with the probate court requesting payment from the assets in the deceased’s estate. The "executor," or person managing the estate, pays as many of the valid claims as possible out of available assets. In many states, there are informal alternatives to the traditional probate process that allow an estate to be handled faster, and more informally. (These alternatives are also less expensive.) Also, some states allow small estates - where there aren't many assets and the assets are not worth much - to avoid probate all together. Instead, the deceased persons debts are settled through a non-court process. The person who died is your spouse. In this instance, you could have some obligation to pay his or her outstanding debts. If you live in a community property state: Alaska, Arizona, California, Idaho, Louisiana, Nevada, New Mexico, Texas, Washington, and Wisconsin you may be responsible for debts incurred by your spouse during your marriage even if you did not cosign. A probate or estate planning attorney can help you determine whether that's the case. Warning! Follow the rules! When someone dies, his or her estate is supposed to go through the probate process (or some other state-approved process) during which as many of the deceased's debts as possible are paid out of the assets in his or her estate. (Necessary funeral and final expenses can often be paid first, however.) Only after that happens, can any assets that may be left be distributed to the deceased's beneficiaries. 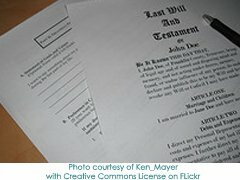 Therefore, if a relative of yours dies and you and your siblings (or some other relatives) decide to avoid the probate process so that there will be more of the deceased's estate for you to divide up among you, the creditors of the deceased may be legally entitled to come after you for the money they are owed. The tricky part for creditors and collectors has been trying to identify the person responsible for handling the financial matters of the estate when there is no formal probate process and no one has been named as executor. In some states, where a less formal process has been developed, the person handling the final matters of the estate will be called the "personal representative" though there are other names for that role. Don't be confused. Just because you are managing details like the funeral, that does not mean you are responsible for handling the deceased persons debts. Figure out who is going to be officially handling these matters and refer all creditor calls to that person. Once a debt collector has located the person acting as personal representative, executor or something similar, they must stop calling anyone else. If you aren't sure which assets of the deceased may be protected from creditors (a vehicle, savings, jewelry, bank accounts etc.) we recommend you talk with an attorney with experience in handling these kinds of issues. Look for an attorney with experience in estate planning. If the collector breaks the law, you may be entitled to damages and the collection agency may have to pay your attorney's fees as well. That means the consumer law attorney may help you for free. Does something that you just feel isn't right, and you need expert advice. If you are being harassed about a debt of someone who has died, and you aren't already working with an attorney to settle the estate, it would be a good idea for you to get a free consultation with a consumer law attorney. Again, if the collector is breaking the law it may have to pay your attorney's fees. You'll find answers to many questions below. If you have a question that is not answered, we have partnered with JustAnswer.com where you can get an affordable answer from an attorney. You can ask estate lawyers your question now. If there are not enough estate assets left to pay all attorney fees (Florida), what happens? Am I responsible for my mom's apt fix and clean bill after she passed away? personal debt collection from deceased? Is estate responsible for car loan if car returned? Does my deceased husbands estate have to stay in probate in order for my to receive his asbestos settlement checks? Can medicare take these monies? IRS Debt after death..who is responsible? POA or Spouse? Can debt collectors go after the beneficiary of the life insurance policy? does estate need to pay old credit card debt that was sold to a third party? it ismy understanding that time barred debt can be disallowed. Can unsecured creditor collect against deceased debtors mortgage-free house? My mother signed for her boyfriend to get a car because his credit is horrible and now she is dying. What will happen to the car. When I pass will by children be responsable for paying my government student loans? Can a collection company collect from a person residing in a nursing home whose income goes to pay for his stay? Probable Death of Spouse; How do I protect what little assets there are? Do you have to pay credit card debt that han't been paid since Apr. 2004 after a person dies ? once an estate is opened after parents pass can the heirs pay off the mortgage in full so debtors can not come after it? Government Law Suit, Medical Bills went unpaid. can my sister/siblings sue me? Am I liable for my deceased husbands back child support and taxes owed from bankruptcy? my car is in my mother's name, can creditors take my car? Hi. my name is chad. i lost my wife 2 weeks ago. We live in connecticut. what are the pros and cons of going Vs. not going to probate court? Will my father's estate pay the car loan we got together? Will My Mom Owe the Medical Debt My Deceased Dad Left Behind? Am I Responsible For Late Husband's Debts?